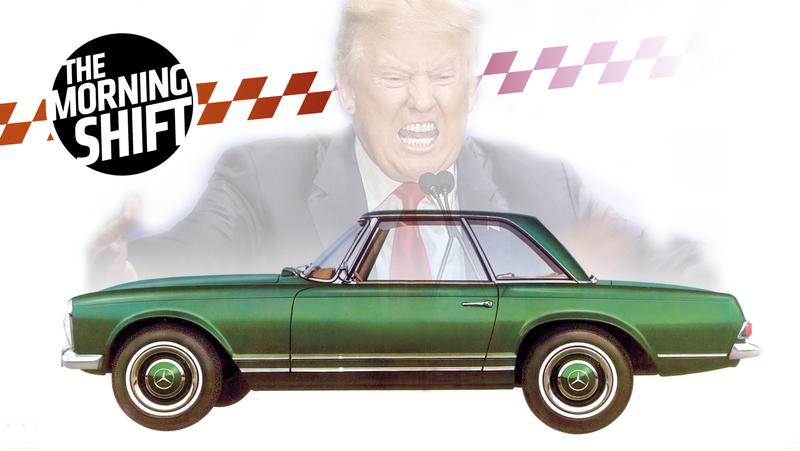 A report that U.S. President Donald Trump has threatened to pursue German carmakers until there are no Mercedes-Benz rolling down New York’s Fifth Avenue dented shares in the luxury car manufacturers on Thursday. ﻿An excerpt from German magazine Wirtschaftswoche’s article, which cited several unnamed European and U.S. diplomats but did not include any direct quotes, could not be independently verified, while a United States Embassy spokesman in Berlin referred questions to Washington. The news and current affairs magazine said Trump had told French President Emmanuel Macron in April that he aimed to push German carmakers out of the United States altogether. Macron’s administration in Paris declined to comment on the report. While there weren’t any direct quotes in Wirtschaftswoche’s report, the idea that Trump wants to wipe Mercedes-Benzes—a marque that manufactures some of its cars in America, mind you—off NYC streets certainly isn’t out of character for the guy. This report was also bolstered by a recent trade investigation that was opened into auto imports, Reuters notes. Further, the Trump administration said Thursday it will indeed impose tariffs on metals, after some waffling on the issue, according to the Associated Press. All of this falls into a larger dispute over trade between the U.S. and the European Union. Germany in particular has warned that ending this exemption could lead to a trade war. Ze Germans are the biggest European exporters of cars to the United States, making up 90 percent of the premium market in the U.S., per Reuters. However, they also employ a large number of Americans in U.S.-based factories, where German automakers produced 804,000 cars last year. That much investment is a promising sign that they think GM can and will actually pull off getting self-driving cars on the road in a year. GM also plans on investing $1.1 billion of its own money into Cruise, bringing the unit’s total value up to $3.35 billion. Japanese police and prosecutors will conduct an on-site investigation at Kobe Steel Ltd.’s offices as early as Thursday, the Yomiuri Shimbun reported, opening the possibility of criminal charges being filed against the company that admitted to falsifying data last year. The Tokyo District Public Prosecutors Office and the Tokyo Metropolitan Police will conduct investigations at Kobe Steel’s headquarters in Kobe, its Tokyo office and several of its plants including the Mooka manufacturing unit for suspected violation of unfair competition prevention law, according to the Yomiuri and other Japanese media reports. The company currently knows nothing about the report and is looking into it, said spokesman Yoshitsugu Nishimura. Kobe lied about how strong its materials were to clients including Toyota and Boeing, and authorities suspect that it was a systematic, company-wide issue. The Tokyo Metropolitan Police Department and the special investigative unit of the Tokyo District Public Prosecutors Office are working together on the probe, which could lead to criminal charges being filed against the company. As part of its five-year strategy plan to be announced Friday, Fiat Chrysler is likely to announce the intention to form a finance unit in the U.S., Bloomberg reported, citing people familiar with the automaker’s plans. Shares of Dallas-based Santander plunged 6.4 percent to $17.86 on Wednesday. Santander Consumer has struggled to reach market share targets that it set along with Fiat Chrysler as part of the 10-year financing agreement the two companies inked in 2013. The lender financed 28 percent of Fiat Chrysler’s total loans and leases as of the end of December, well short of a goal to reach 65 percent by the end of April, according to a regulatory filing. If Chrysler Capital fails to meet origination goals within the first five years of their deal, Santander’s deal with FCA can be terminated, thus opening up FCA to do this. Santander isn’t the only lender an in-house lending effort could siphon away today’s insane 84-month loans from. Ally Financial (which formerly GM’s own lending arm, before the auto industry bailouts) got over a quarter of its business from originating over $2.44 billion in loans and leases for FCA dealers last year. An FCA spokesman declined to comment on the change. But one Michigan FCA dealer, speaking on condition of anonymity, told Automotive News that the program was widely abused in the region, damaging dealer profitability. The dealer said he had seen employees selling employee pricing control numbers for as much as $300, and alleged that some dealers maintained a network of FCA employees to access discount numbers for otherwise ineligible customers. The program allows FCA employees, retirees and their immediate family members get a discount of up to 5 percent off the factory invoice price of an FCA vehicle. Neutral: Will GM Pull It Off? Part of SoftBank’s investment in GM rides on their ability to put autonomous cars on the road by next year. Do you think they’ll be able to do it, or will it end up feeling like another scandal-ridden beta test for the road? Correction, 10:26 a.m.: This post has been clarified to note that tariffs are being imposed on metals, not cars (yet).